They're back! 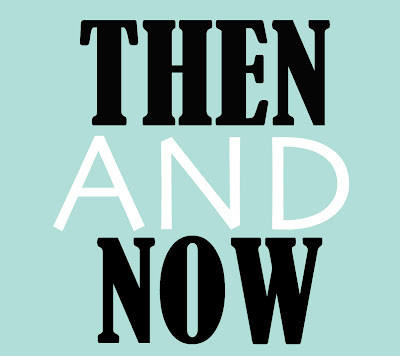 The then and now posts have returned! Have you missed them? I know from reading the giveaway comments that a few of you have. These nails were done about 2 weeks ago, maybe even longer, but the past couple of saturdays I've just been too busy to post them, but they should return to being weekly now. This is a design that I remember doing, and remember removing straight away to try another design (which I'm sure will make an appearance at some point), something I'd never done before and something I never did again until I starting painting more regularly (aka now) because I didn't much like 'wasting' nail varnish. As you'll see, the design was also pretty rubbish so it was no big loss to the world that they didn't last very long! I'm sure many of you will know that this design isn't original, but as with all of these posts, I can't remember where I got the original inspiration from, so for now I cannot give credit, but if you know who originally created these then please let me know. The original picture is after the jump! 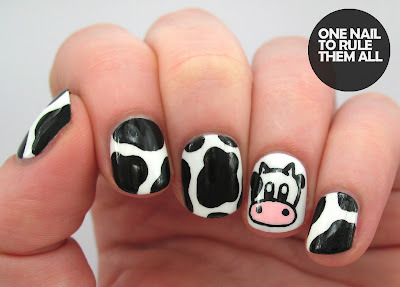 As you can tell, I was a true natural at nail art, and I really knew how to make my photos look great! (I hope you can hear my sarcasm right here). In the original post, and now, I used Barry M - Matt white as the base, the only white I'd ever used until I chanced upon a bottle of Essie - Blanc in TKmaxx a few weeks ago. The black was probably previously Barry M - Black, but I can't tell you any more than that, except that it was all done with dotting tools, as were all my previous designs. This time the black was China Glaze - Liquid Leather for the spots (is that what they're called?) 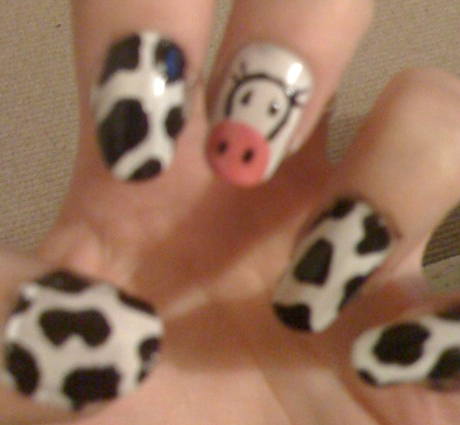 and the cow was done with acrylic paint, all topped off with a coat (or possibly two I cant remember) of Seche Vite. As you can see, I completely changed the cow, mainly because it previously looked nothing like a cow! What do you think? Let me know in the comments, I always love hearing what you have to say! P.S. dont forget to enter my giveaway! Awww I think both cows are very cute! That is a huge improvement! 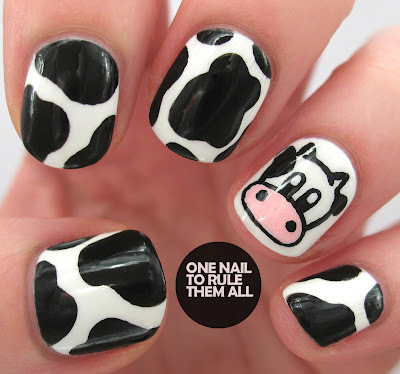 "Then and cow" made me giggle c: . Definitely my favourite so far, I LOVE the now nails! That cow is just adorable! Such a cute mani! I love it! 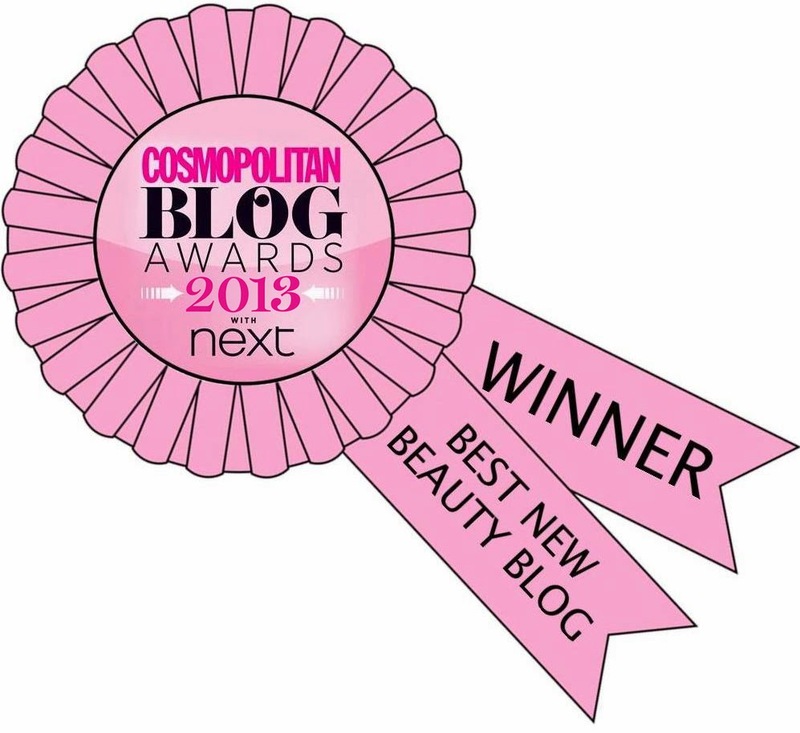 i've just discovered your blog and it's fab! 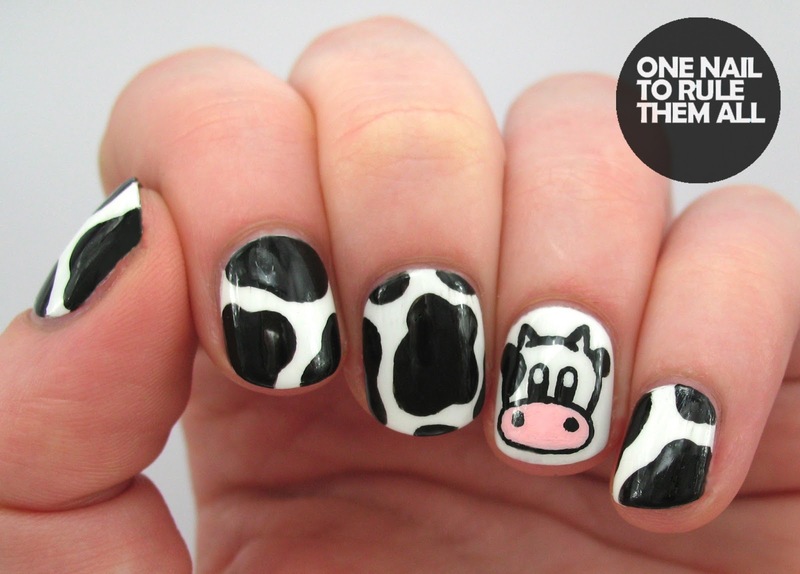 your nails are so creative, you should be really proud of them. i love this little cow, it's so cute! I love your Then and Now posts! It gives me hope for my own skills. I thought your first cow was cute too. I love this, and it makes me laugh, because when I was in sixth grade we had a club called "MOO Club" -- some acronym for something anti-drinking/drugs, but I don't remember what it stood for anymore. Anyway, I used to paint my nails with cow spots for MOO Club events and it was generally bad, I should try it again now! I live in Wisconsin, so cow spots are always appropriate. So fun! I loove your blog and I love this idea! I think I may have to do this myself and see how my 'skills' have improved since I posted my first nail art attempts when my blog was first created. They're probably still pretty poor though! hahaha your sarcastic comments made me laugh out loud. these are so adorable i can't stand it! Is your heart made of gold? More valentines and a new technique!